PORT-AU-PRINCE (Reuters) – A child squats to defecate yards away from a sidewalk where women press plantain into bite-sized pieces for frying and a naked toddler plays with a pile of rice on the filthy ground. Nearby, a dead body has been dumped on the street, right in front of a sea of morose people sitting on grubby mattresses, and a garbage collector uses a shovel to scoop up soggy black mounds of putrid trash composed of plastic water bags, polystyrene plates, orange peel and tin cans. Stray dogs forage. Earthquake survivors transformed the church school soccer field, like nearly every open space in Port-au-Prince, into yet another of the city’s impromptu survivor camps. But “survivor” — unless the coming public-health disaster festering in these squalid camps can be stanched — may become a brutally ironic term. These are potential death camps. As the two boys played, a third child emerged from the jumble of makeshift tents, carrying the family slop bucket. He dumped the fetid contents, an accumulation of human waste, just at the edge of the field. He illustrated the city’s sanitation crisis in microcosm. Dr. André Vulcain of the University Of Miami Miller School of Medicine, back from seven days with the UM medical team in Port-au-Prince, talked about the horrible potential brewing in camps that have become the semi-permanent address for a million, maybe two million people. There’s talk of flu. Dr. Greg Elder, deputy operations manager for Médecins sans Frontie&grave;res in Haiti, told reporters that he has seen death in those awful camps from septic and gangrene from wounds in the Jan. 12 quake. Other doctors have reported signs of salmonella, shigella and campylobacter and bacterium leptospirosis, a skin disease. Dr. Vulcain said scabies, caused by a mite that burrows into the flesh, will flourish in the camp squalor. He talked about an urgent — life-and-death urgent — need to bring not only some measure of sanitation into the camps, but a renewed emphasis on hygiene, given the circumstances. Bringing fresh, clean water and soap into the camps without emphasizing the heightened necessity of frequent hand-washing, he worried, won’t stave off the second disaster stalking Haiti. PARIS — Decomposing bodies in Haiti are unlikely to pose a major threat to health, although leaving the dead untended or dumping them in mass graves risks intensifying grief and sparking resentment, experts say. In the popular mind, corpses must be swiftly collected and buried or burned to avoid spreading cholera, plague, typhus and other killers. But specialists say this is more often than not a myth. Investigations published in the medical press suggest that, in many cases, post-disaster outbreaks of disease can be traced to unclean water supplies, poor sanitation or respiratory infections among sick, cramped survivors. Corpses “do not generally create a serious health hazard,” says a 2002 UN assessment, Environmental Health in Emergencies and Disasters. Decomposing bodies “are a problem, in that they smell and they look awful, but this is not especially the biggest problem,” said Michel Sapanet, a pathologist at the University Hospital Centre in Poitiers, France. People handling corpses have to be suitably protected with masks and gloves to avoid infection by HIV and other blood-borne microbes. 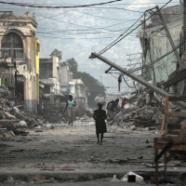 More than 150,000 quake victims have been buried by the Haitian government, a minister said. 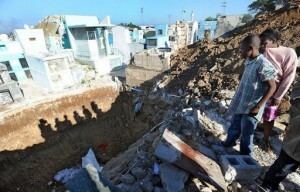 The truckers filling Haiti’s mass graves with bodies have reported ever higher numbers. That total does not include those still under the debris in the capital Port-au-Prince, carried off by relatives or killed in the outlying quake zone. Daily water requirements for the estimated 3 million people affected by the earthquake range from 6 million gallons as a short term minimum to 24-45 million to sustain the population in the longer term. These requirements make it extremely difficult for water imports to do much more than supplement locally accessible supplies. Sewage collection networks were non-existent in the city prior to the earthquake. Water supplies are almost certain to be increasingly tainted by waste due to blocked ditch/culvert flow that in some areas had previously transported waste to the Bay of Port au Prince, possibly resulting in disease outbreaks. Contamination of local food and water sources with pathogenic bacteria, parasites, and viruses from raw sewage can lead to a variety of acute and chronic diseases. STARVING Haitians grabbed frantically for handfuls of food aid yesterday as the struggle to get help to three million survivors of the earthquake dragged on into a seventh day. The UN World Food Programme gave rations to 95,000 people yesterday, up from 67,000 on Sunday, but UN officials admitted two million deliveries a day were needed.